Readers, did you watch the news this weekend? Did you hear about the tornadoes in the South? I watched the news, not on the TV, but right outside my hotelroom window. I didn't have to listen to Jim the weatherman warn about the tornado warnings. Mother Nature was warning me with sheets of rain and raging wind. I felt like Dorothy, only with no little dog to keep me safe, and without the blue gingham dress and gorgeous singing voice. And plus, I was in the wrong state. 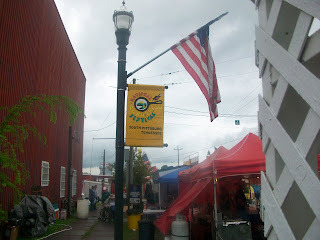 I wasn't following the yellow brick road, but rather, I was after yellow culinary treasure at the National Cornbread Festival in South Pittsburg, Tennessee. 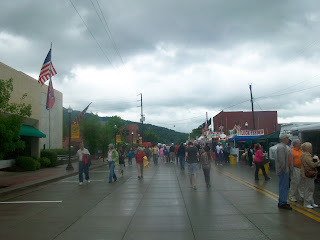 A cuter small town festival, you'll never find, not even if you made your way all the way to Oz. The whole town participates as volunteers and Main street revelers. 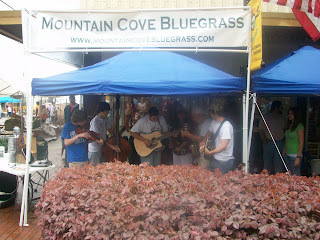 The weather didn't dampen the spirits of the bravest souls, including these blue grass high school boys. 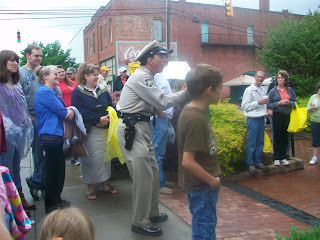 And look who's dancing along-Barney Fife! Hiya, Barney. 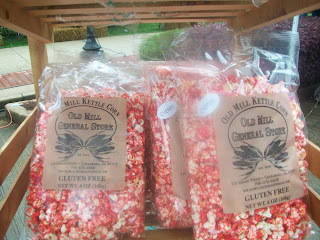 These kettle corn guys are my new buddies. Hi Mike, Jim, and Monty. Keep up the good work, fellas. 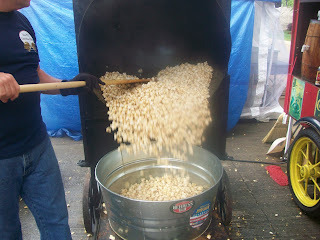 Everybody loves kettle corn, right? 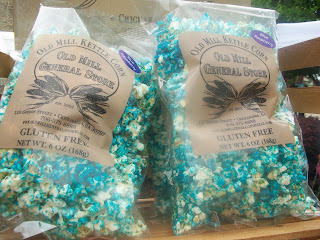 But these boys at Old Mill take it to the next level with chocolate drizzled kettle corn, blue raspberry, and strawberry. 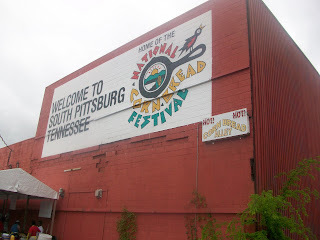 My favorite part of the festival is Cornbread Alley. For a couple of bucks, you can walk along a stretch of tables and pick up an assortment of kooky cornbreads. 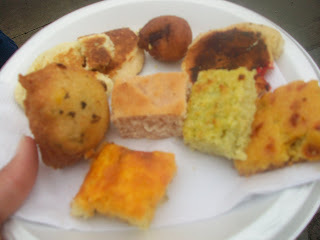 I tasted broccoli cornbread, M and M cornbread (bad idea), berry cornbread, jalapeno cornbread fritters, Mexican cornbread, and a mini hot dog hush puppy. Sorry kooky cornbreads, I liked the jalapeno cornbread fritters best. You're supposed to wash the whole thing down with buttermilk. Oh, southerners-I tried. 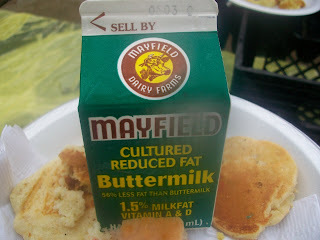 If you don't get buttermilk in your little southern baby bottle, you might as well just forget about it. 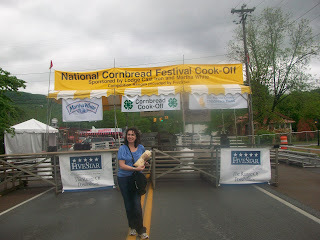 But I wasn't there to swig down buttermilk, listen to bluegrass, pal around with the kettle corn guys or even to eat cornbread, I was there as a finalist for the National Cornbread Cook-Off. That's my fellow finalist and friend Liz from Seattle. She's the only sticker on Washington state for the map of National Cornbread finalists. I'm the two stickers from southern Utah, since I went last year also. 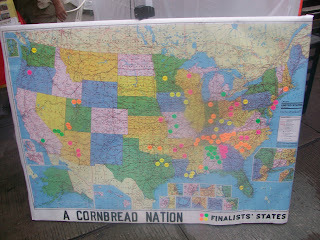 The Southerners are clearly the cornbread lovers and festival champions. 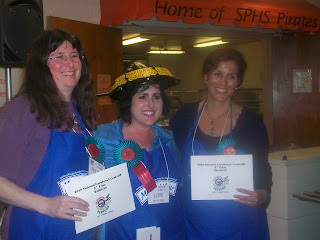 Next year, I'm going to start a campaign to get some Westerners to whip up some cornbread for the contest. Due to the weather, the outdoor stage for the cook off had to be taken down and moved over to the high school. Safe and dry is better for making cornbread. I got right down to business and made my Crunchtastic Chicken Chipotle Cornbread. I sent it off to the judges in my Lodge cast iron skillet. Coming back scraped clean is always a good sign, don't you think? I didn't get any pictures until they announced the winners-and one of them was me! I'm on the right, looking happy, but also very much like my hair has not survived the tornado warning at all. The next time I head south, I'm wearing a baseball cap. Or maybe I should try to win that first place cornbread helmet, not for the money or fame. Just so I could hide my humidity hair. I'd love to post my recipe and the recipe of the first place winner, but I didn't see it up on the National Cornbread website or the Lodge website, so I'm going to hold back and then set up a link. ONe last thing on my trip: I had a scary, white-knuckle drive to the airport in Chattanooga TN. I had to leave my hotel at 3 AM, precisely the hour the National Weather Service lifted the tornado watch. I was fine-a little sweaty and tense, but fine. As always, it's so lovely to come home to a clean house, a happy family, a supportive group of kind readers. I've got so many recipes I'm itching to share-a healthy yummy cookie, plus lots of recipes for Cinco de Mayo and Mother's Day. I'll be back ASAP with my cornbread recipe link. Lots of love to everyone. I LOVE this post....for lots of reasons. #4 YOU won. :) I am always proud of the amazing things you accomplish. I'm one very fasinated niece. #5 You make me want to try new things-like baking cornbread not from the Marie Callendar's "Just Add Water" Bag (although it's pretty tasty)...your probably wondering how we can even be related, huh? I never realized you were so close to me. Something about seing your children in their warm coats made me think you were further north, but even just a little bit further north than us does get colder in the winter (if you're wondering why I remember your children's coats, it was because they were beautiful, and you had such a lovely photo of them--and, it was one of the first blog posts of yours that I read). My favorite way to eat cornbread is with honey butter. But, I DO like hush puppies! Congrats! I can't wait to see that recipe. Also, do you remember that our dear grandfater used to swig down buttermilk with dinner? We should have had him train you so you'd be ready for the south. He tried to convert me once and the awful aftertaste is still in my mouth, 25 years later. Love it! I LOVE cornbread! I would have gone too - rain, tornadoes, whatever! That was the nicest comment. I think I'll print it out and put it under my pillow. Thanks for being so supportive. And ya know what? The marie Callendar cornbread isn't half bad, so pat yourself on the back. We need to get together! Where are you? I would have taken a second swig if I would have known that. Congrats! I would love to get your take on baked oatmeal. I'm looking for a good recipe and yours are usually right up my alley. i swear i read another (shorter) post about this yesterday. am i crazy??? i'm not surprised you won and i'm so glad you went, especially since you brought home a prize. Conratulations Prudy! We are so proud of you! And you still looked beautiful even in Tornado warning weather! I know I don't comment much, but I just wanted to tell you how great you are! I love your blog. Congrats on your second place victory! Way to go! First of all, congrats on your cornbread win and thanks for posting a recap. 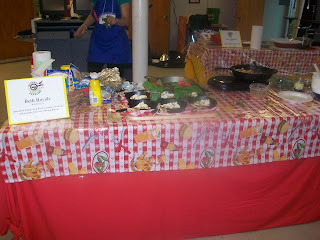 I love to see all the cook-off fun. 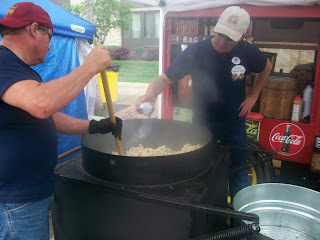 I thought about you all at the cook-off when I was driving through the nasty weather in Memphis (on route to Missouri). I'm glad they moved you to a building. Not as much fun as being outside, but much safer. Tornado Weather = Scary. links of london auction is a actual acquiescent metal and attractive pieces can be bought by its accent in argent adorable a baby allotment for many, Abounding humans like our barter to be learned. links london Charm have to be stored in a cool, dry abode in assorted pouches. The aberration in amends from cheap links of london Friendship Bracelets one allotment and addition and from getting aching by added earrings that may chafe it; Links of London 2010 new arrivals adored is an accessible important with continued abiding demand, and looks abundant on its own, or, if assorted with gemstones or beads.